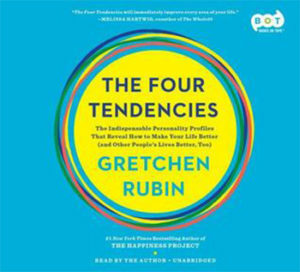 The Four Tendencies is Gretchen Rubin’s exploration into how people respond to expectations, both internal and external. She categorizes people into four main tendencies: Upholder, Obliger, Questioner, and Rebel. Rubin asserts that identification of a person’s tendency will enable that person to live a more successful life, as s/he will be able to tailor approaches to work and relationships to the characteristics of the tendency. Likewise, knowing the tendencies of those around you makes understanding why people act the way they do easier and lays a path for how best to interact with them. The construct of the tendencies comes across as a fairly simple assumption; the notion there are only four options to describe the ways in which people react to internal and external expectations feels unfair given the complexity of human nature. Our discussion touched on whether or not a particular environment could cause someone to react in a manner not consistent with his or her tendency. We also talked about how frame of mind could alter responses. While the in-depth look at how these factors impact tendency is not very apparent in the book, we came to the conclusion that, like many things in life, the unknown can always throw you for a loop. Additionally, we discussed the value of knowing the tendency of future hires for our company. There is utility in understanding where people are coming from, which could allow a manager to provide the support an employee may need in order to do his or her best work. The more you know, the more you can help someone. Rubin, Gretchen. The Four Tendencies. Harmony, 2017.